A sharp decline in North America's monarch butterfly population (90 percent in the last 20 years!) means the species may soon be headed for protected status. 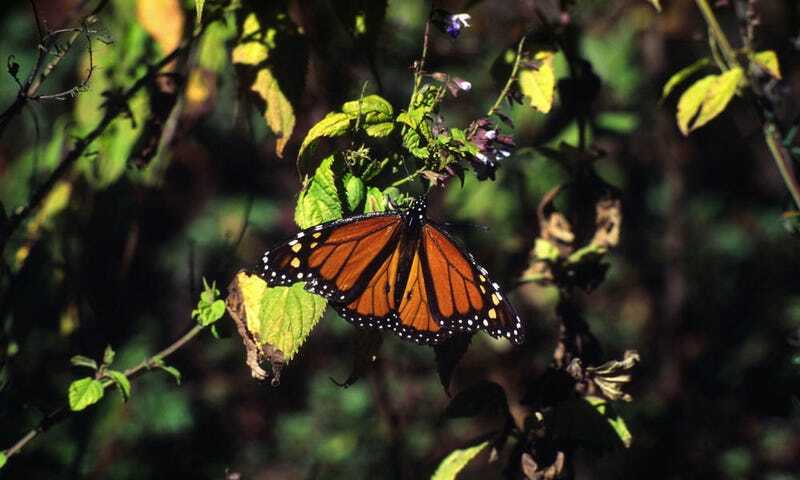 On December 29, the US Fish and Wildlife Service announced it's "launching a scientific review to determine whether the monarch butterfly should be protected by law under the Endangered Species Act, a 1973 law designed to protect species from becoming extinct," Discovery News reports. Why are monarch butterflies in danger of dying out? Genetically modified crops have a lot to do with it, since they're created to withstand an herbicide that destroys milkweed, the butterflies' food source. Things are dire: the Xerces Society for Invertebrate Conservation reports that "the population has declined from a recorded high of approximately one billion butterflies in the mid-1990s to only 35 million butterflies last winter, the lowest number ever recorded". But placing the migratory creatures on the endangered species list could help avert disaster. The law not only bans the killing designated species or harming it in other ways, but it also requires federal officials to work with state and local agencies to come up with a recovery plan for restoring its numbers. Additionally, the federal government can protect habitat that's critical to the species.